BACKTIME: Which Green Team will show up in Cincy? 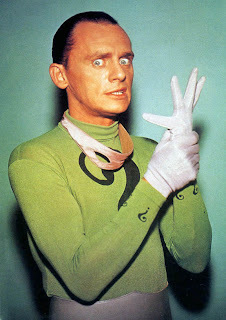 The Riddler was a pretty devious guy, so he must have chosen green for a reason. Maybe it was to torment the faithful of the AFC's New York/New Jersey franchise by keeping them on a yo-yo string. Even for a star-crossed franchise like the Jets, this had to be one of the weirdest seasons of all-time. Bill Parcells once famously said, “You are what your record says you are.” Well that goes out the window once the playoffs begin. The 9-7 Jets caught some breaks down the stretch, but now they have a shot just like everyone else. So now we have to wonder which Jet team is going to show up. Is it the Jet team that was literally a handful of plays from 14-2? A team that Rex Ryan declared “should be favored” to win it all? We laugh at Rex sometimes, but it’s a Jets team that has truly changed the culture under the rookie head coach. It is the first Jet team I can remember with a dominant defense. They’ve had some big-play defenses before, but never a shutdown unit like this one. The running game has also out-toughed opponents at the line of scrimmage, behind an O-Line featuring 3 Pro Bowlers. Or will we see the team that has 5 bizarre losses in the final minute? Two losses to Miami – in one, they couldn’t stop the Wildcat, in the other they couldn’t cover a kick. The home loss to the Bills 16-13 in OT that set football back two generations. The Jets threw 6 picks and still had a shot. I’d never rooted so hard for a tie in my life. The slide by Maurice Jones-Drew to kill the clock and set up the Jags’ winning FG. The failure to cover Tony Gonzalez on a 4th and goal in a game handed to Atlanta. Maybe the culture hasn’t changed all that much after all. But then when they needed a win to get in last week, they whipped Cincinnati 37-0. It was important victory for a number of reasons. 1) The Jets have served up so much heartbreak to their fans throughout the years. But in this case, they removed all doubt early and gave their die-hard fans a well-earned laugher. 2) They got in the heads of the team they turn around and play the next week. 3) They have a viable offensive weapon in Brad Smith. The former Missouri QB is now filling the role vacated by the loss of Leon Washington early in the season. And what of the Bengals? The team I enjoyed so much in Hard Knocks is now the enemy, despite Ochocinco’s weekly theatrics and Cedric Benson’s redemption. If the Jets can get a big play from Sanchez and the passing game on the first series, the running game will open up and it should be lights out. I said before last week’s rout that the “Jets would win either 30-3 or lose 9-6.” And that logic still applies. Because you never know what to expect with those guys in green. They may win another laugher and they may lose again in the most excruciating fashion. They’re a mystery inside an enigma all wrapped up in a riddle, or however that saying goes.